Ever since gold was discovered at Sutter’s Mill in 1848, visitors from all over the world have flocked to San Francisco. Today, it’s still possible to find gold in the “City on the Bay” in its numerous restaurants, beautiful neighborhoods, and world-class cultural attractions. From the days of the gold rush to the advent of the Internet boom, San Francisco has earned its reputation as a stylish, high-livin’ town. Whether you prefer to hob-nob on Nob Hill or rub elbows with Internet gurus in the Mission, this posh peninsula offers infinite opportunities to spend a weekend in style. San Francisco Bay was the source of the city’s livelihood for a very long time, and it remains the key to the city to this day. The Golden Gate Bridge, a San Francisco icon, is 1.7 miles long and frames the Bay. The Bridge is an architectural marvel, and is one of the longest suspension bridges in the world. The two towers are purposely out of alignment in order to compensate for the curvature of the earth. It’s orange shape is beautiful to behold, whether it is on a clear day, or peaking above the rolling fog of the bay. Visitors should drive across it, take photographs of it, and enjoy this national landmark. Located around the Bay are several remarkable beaches and parks. Golden Gate Park contains several museums, gardens, and open spaces. The Presidio, a 200 year old Spanish Fort, is also a well-known Bay Area attraction. Sitting on 43 hills, and surrounded on three sides by water, San Francisco is ideally located so that almost every one of its streets ends or begins with a panoramic sea view. Some call it The City By the Bay, but to most of its residents, it is known simply as The City. Seldom has there been such a passion for preserving the past with its colorful legends and architecture as there is in San Francisco. Seven times, it has been rebuilt after fires and earthquakes; and seven times, it has been carefully and lovingly restored. The city varies in altitude from sea level to 929 feet because of its configuration. The combined effect of the many hills, the Pacific Ocean, San Francisco Bay, and the Golden Gate Bridge is stunning in its beauty and scope. Established in 1835 as a resting place along the trail and called Yerba Buena, the village had fewer than 100 inhabitants for 13 years. The discovery of gold rapidly raised that population figure to over 10,000. Only a handful made a fortune from gold, but many stayed on to develop the city that became San Francisco. Today San Francisco is an important industrial, tourist and financial center. Its financial district is often called “Wall Street West.” The city port handles huge amounts of cargo annually and ranks among the top ten ports in the world for passenger traffic. George R. Moscone Convention Center occupies a city block between third and Fourth Streets and Howard and Folsom Streets and is almost entirely built underground. Across the street, is the Center for the Arts at the Yerba Buena Gardens, a visual and performing arts complex. San Francisco has a world-class symphony orchestra, opera, and ballet. Other not to be missed attractions are the San Francisco Maritime Museum, the California Academy of Science, the Natural History Museum and the Japanese Tea Garden. Restaurants and nightspots span the entire spectrum of fine cuisine and the best in live music and dance. Sports are at the top of the charts with everything from golf, surfing, fishing, skiing, basketball and swimming to the unforgettable San Francisco 49ers and San Francisco Giants. In recent years, San Francisco has consistently received the highest score of any city in the United States in Conde Nast Traveler Magazine’s Readers’ Choice Awards. San Francisco also scored highest in the world in the Restaurant category and highest in the United States in the Environment Ambiance. The year 2000 marked the twelfth of thirteen years that San Francisco has been designated Best City in the United States and the third year as the leader in the Restaurants category. The Bay Area, extending from the suburban communities north of Oakland and Berkeley south through the peninsula and the San Jose area, is really one continuous mega city, with San Francisco as its heart. A prominent feature of San Francisco is that beautifully fluffy, chilly, wet, heavy, material called “fog” which makes the city’s weather so mysterious, exciting, and unpredictable. A rare combination of water, wind, and topography creates Northern California’s summer fog bank. It lies off the coast, and rising air currents pull it in when the land heats up. Held back by coastal mountains along a 600-mile front, the low clouds seek out any passage they can find. The easiest access happens to be the slot where the Pacific Ocean penetrates the continental wall: otherwise known as the Golden Gate! While in San Francisco, be sure to save time to visit Fisherman’s Wharf. The wharf once bustled with Sicilian and Genoese fishermen unloading their catches to sell. There is still a fishing fleet, but the wharf is lined with more than a hundred seafood restaurants and steaming crab pots as well as marine gear suppliers, and sidewalk performers. From there it’s a short walk to Chinatown with its pagoda roofs; colorful lampposts, and fascinating shops. The 853-foot Transamerica pyramid marks the heart of the Financial District, as does Embarcadero Center. Nearby is the home of the new San Francisco Giants baseball stadium, Pac Bell Park. 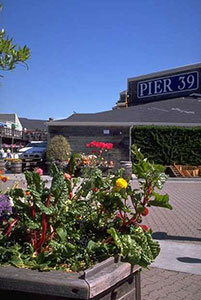 Fisherman’s Wharf and Pier 39 are national landmarks, offering breathtaking views, fine restaurants and great shopping. Millions visit this part of San Francisco each year to gaze across the piers, take in the local scene, and enjoy the attractions of numerous restaurants and fun things to do. Fisherman’s Wharf represents a modern San Francisco, but at a little slower pace. Visitors love the neighborhood and take in the sight of regulars and other visitors. San Francisco bay is beautiful from here! Steinhart Aquarium is the oldest municipal aquarium in America, featuring a wide selection of creatures from both the Bay and the Pacific Ocean. Of course, no tour of the Bay would be complete without mentioning Alcatraz, America’s most famous prison, and now San Francisco’s number one tourist attraction. Moving away from the Bay, San Francisco only gets better. The city’s famous steep hills and trolley cars run back and forth between museums like the Museum of the Legion of Honor and attractions like the San Francisco Zoo, which houses over 1000 animals on 65 acres. The world-famous San Francisco Opera is also a perennial favorite among visitors, as are the city’s numerous restaurants. In fact, inhabitants of San Francisco spend more on dining out per person than any city in America. For a few lucky miners, San Francisco in the 19th century was the gateway to an unforgettable experience. Today’s visitors to the Bay Area feel the same way. The main shopping, hotel, and theater district is at Union Square. A few blocks farther on, the formerly run down factory district has been reborn as a cultural center with the Museum of Modern Art as its centerpiece. Major galleries, museums and restaurants have opened there, as well as Sony’s Metreon theater complex. Yerba Buena Gardens provides constant family entertainment year round with its ice rinks, parks and children’s play areas. It is wise to plan to spend a day of relaxation in Golden Gate Park and to save another day for a quiet stroll along Ocean Beach. A leisurely pace leaves time to enjoy exploring the city and opens space for the unexpected, such as that park that looked to be five minutes away on the map, but is actually at the top of a steep hill! San Francisco is a city of beauty and dignity. It presents to the visitor a banquet of sights, sounds, tastes and aromas to sample, to savor, and to remember forever.